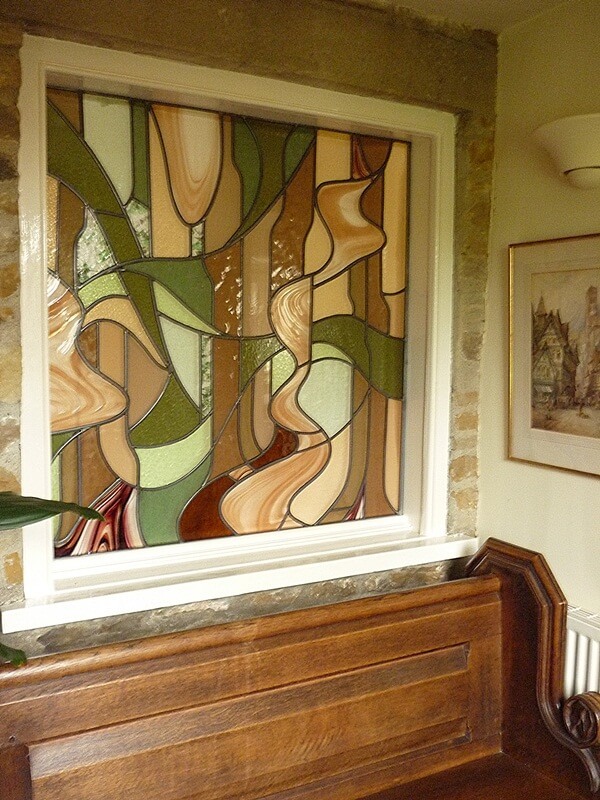 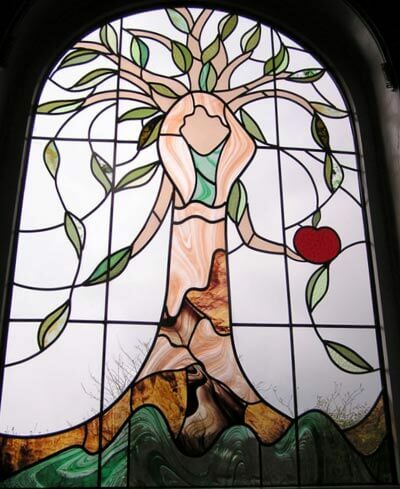 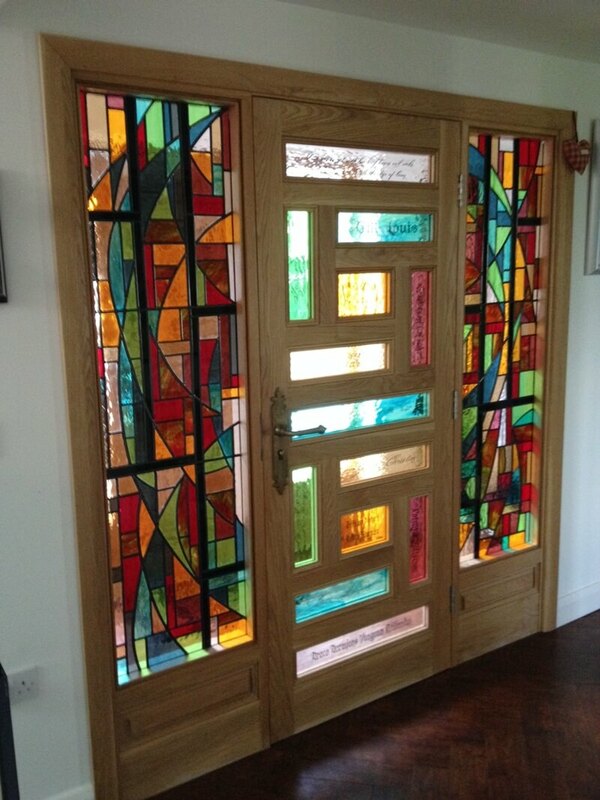 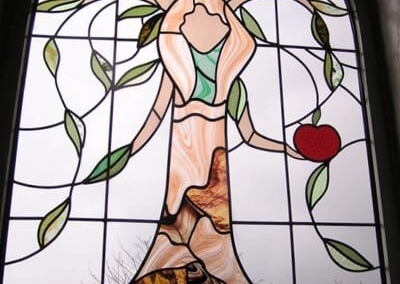 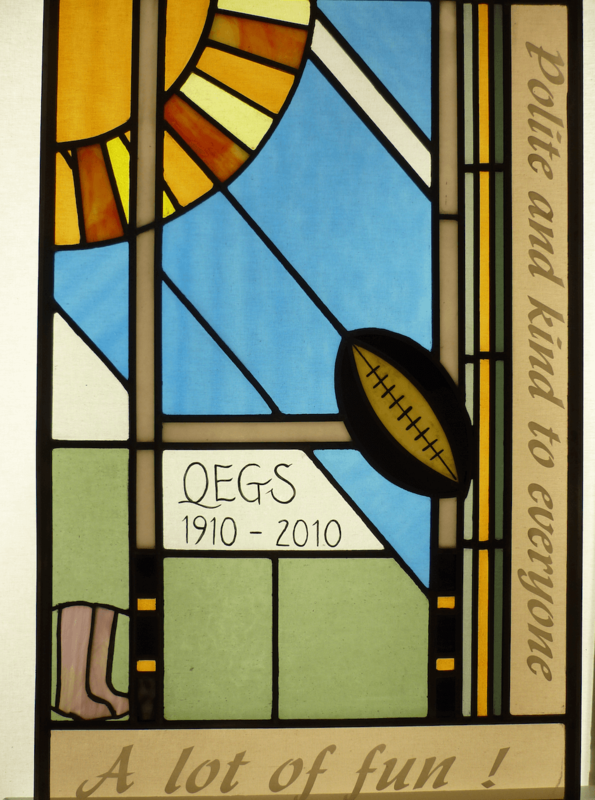 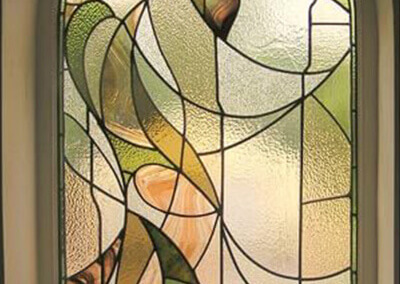 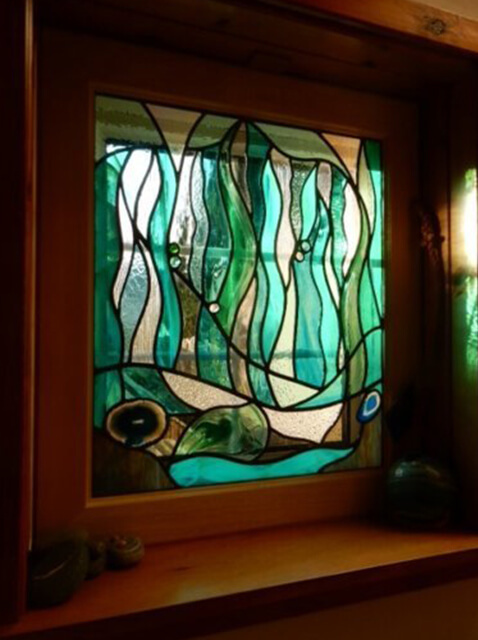 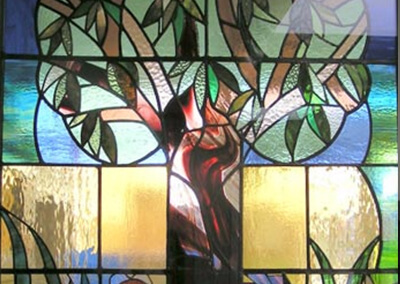 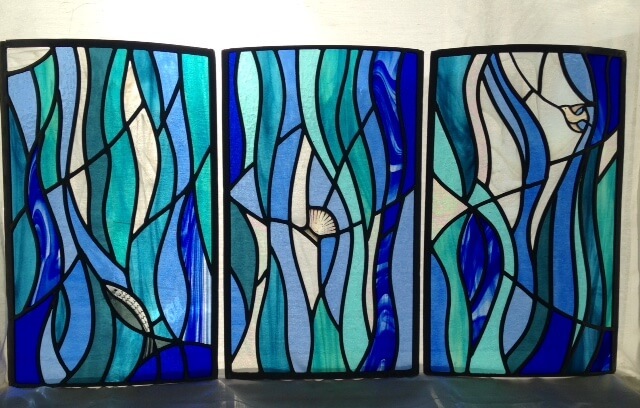 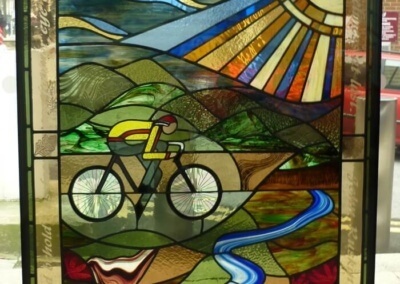 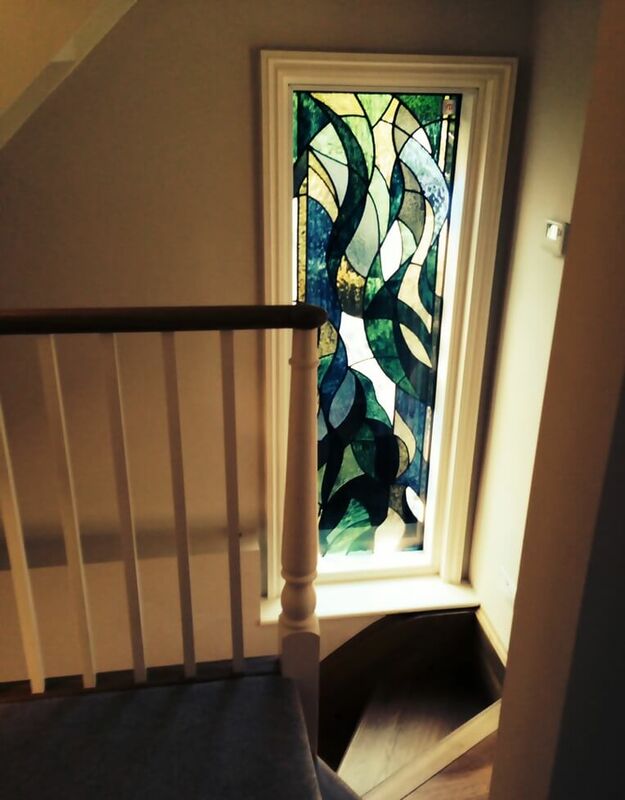 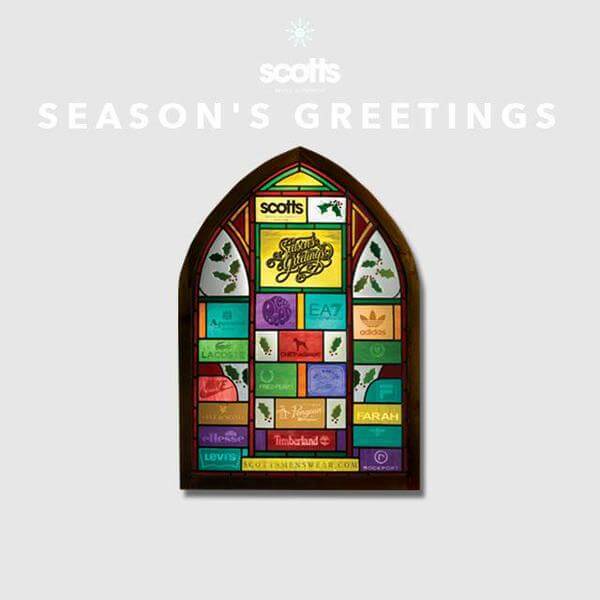 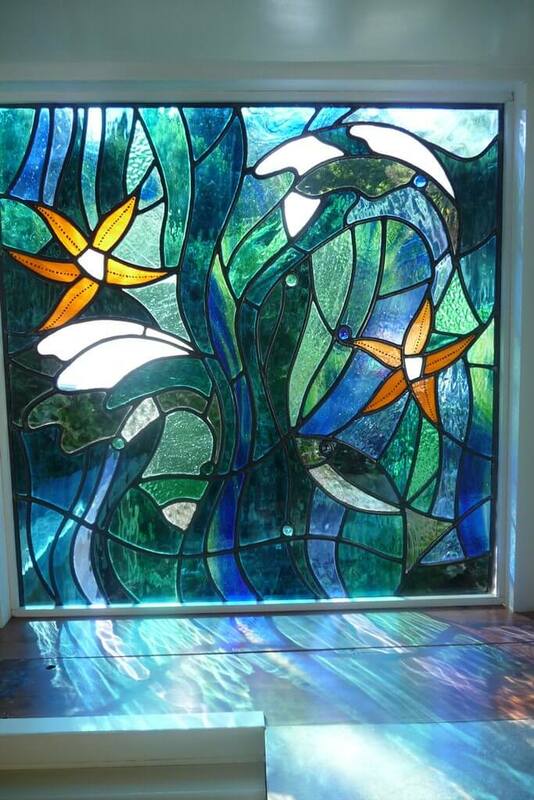 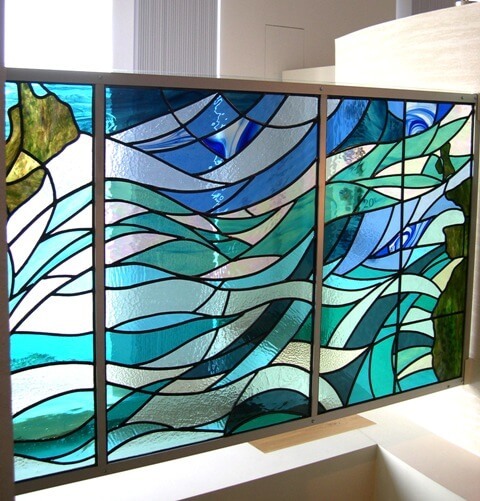 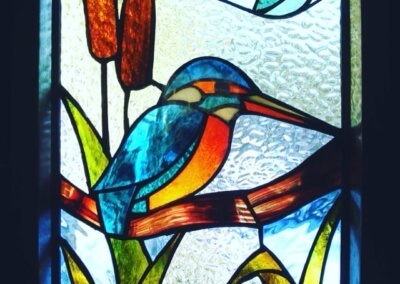 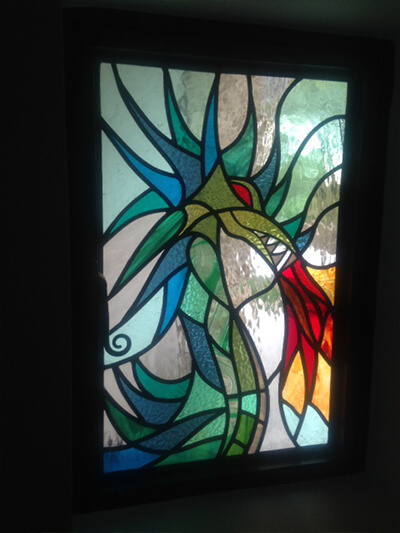 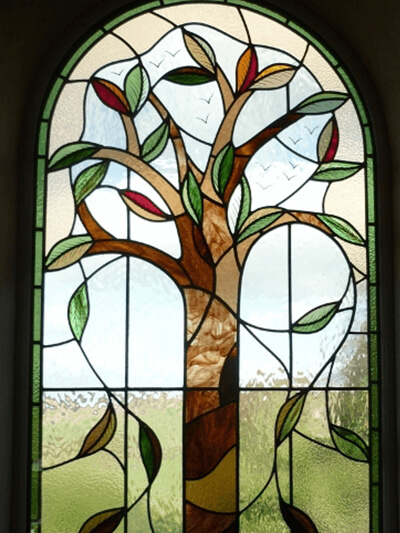 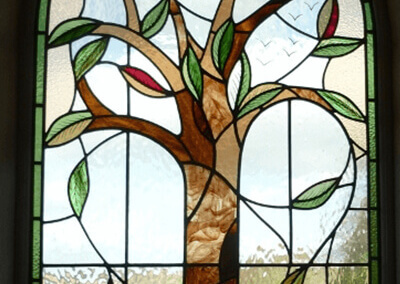 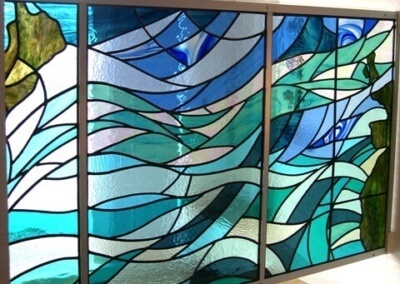 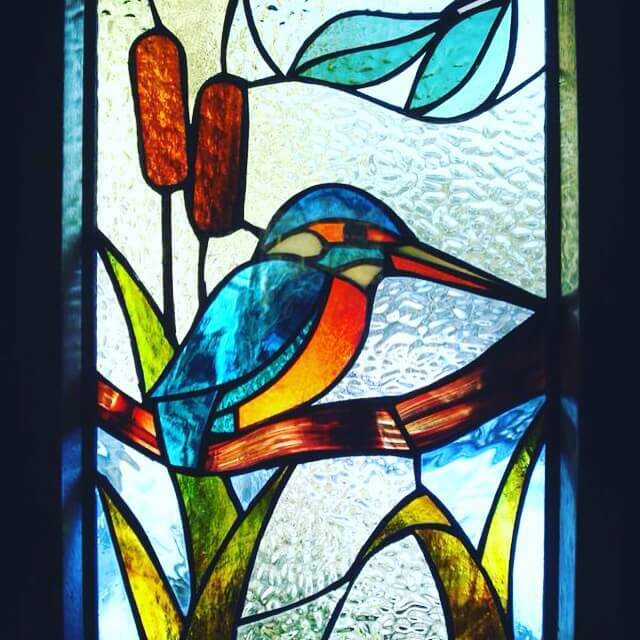 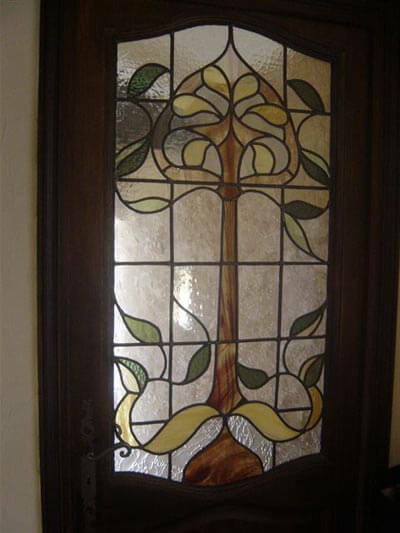 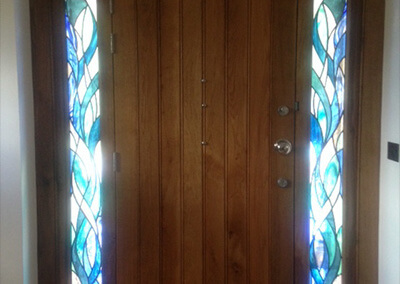 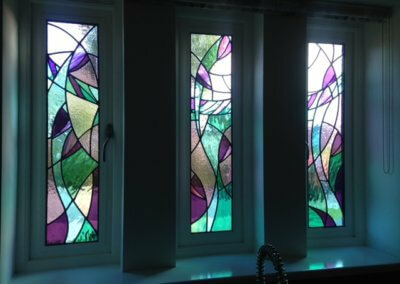 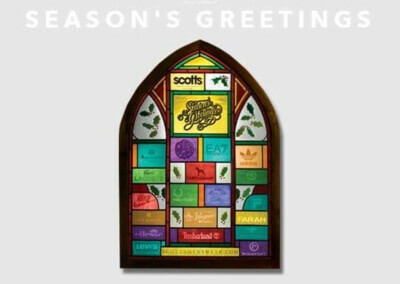 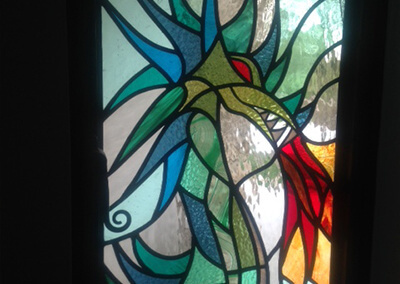 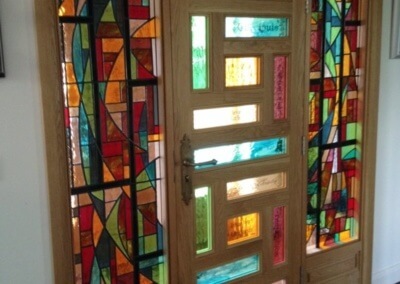 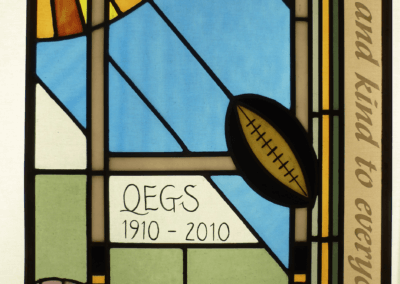 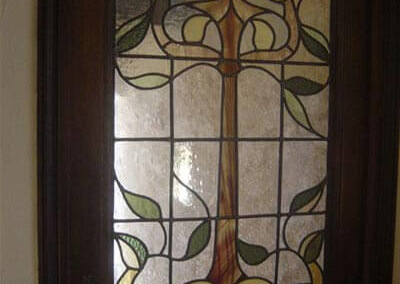 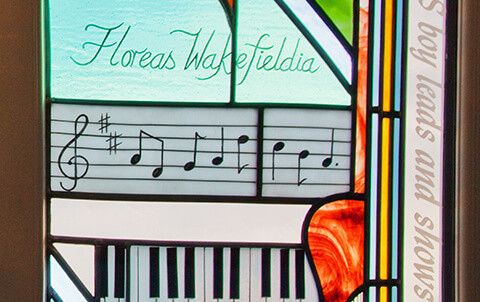 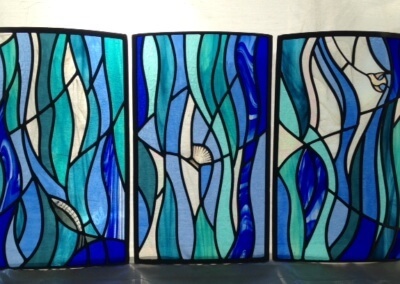 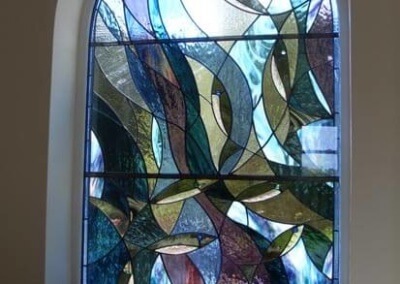 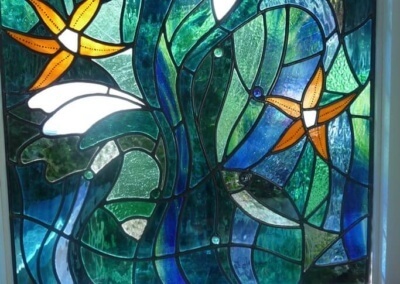 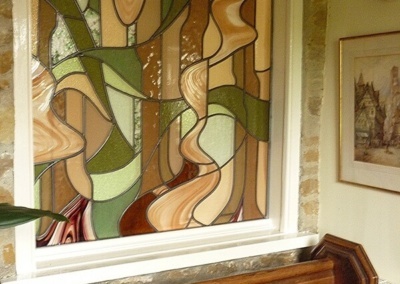 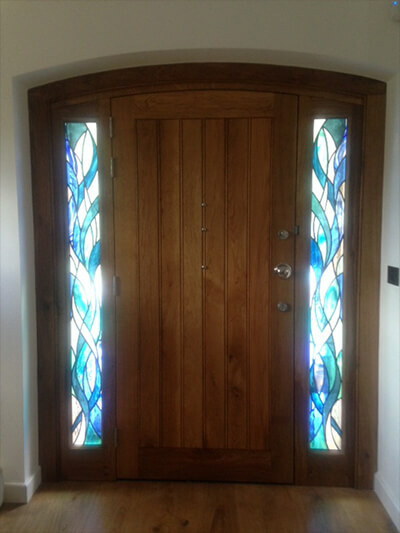 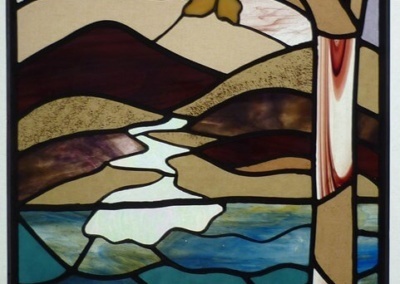 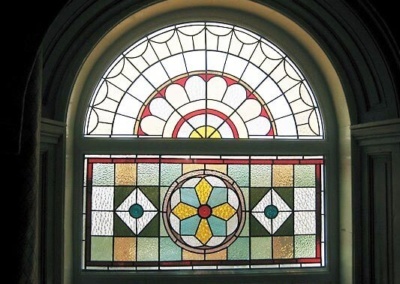 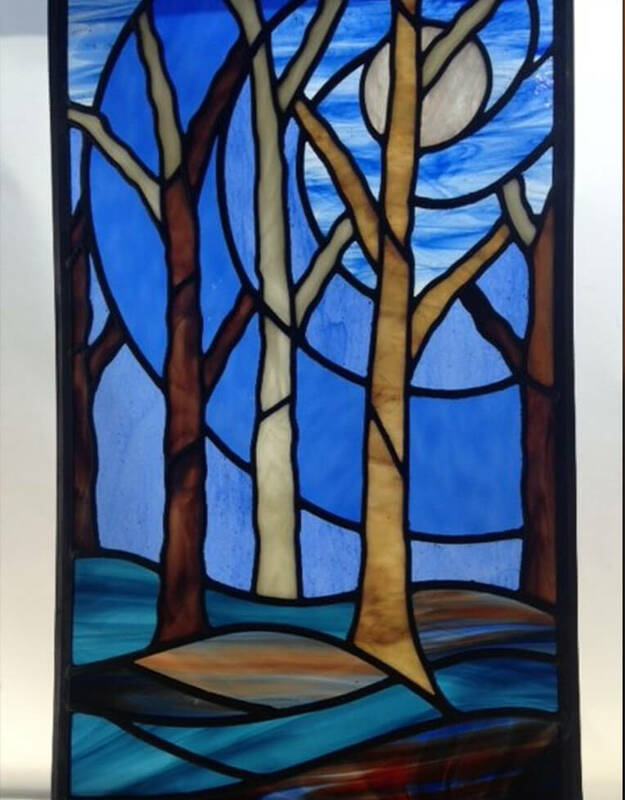 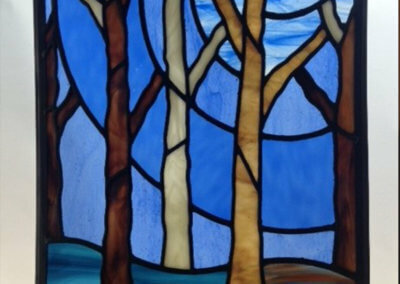 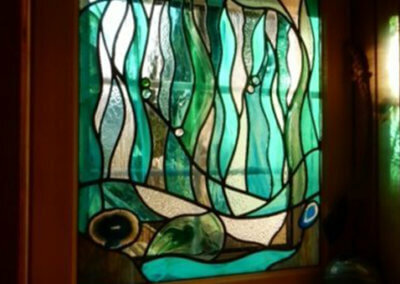 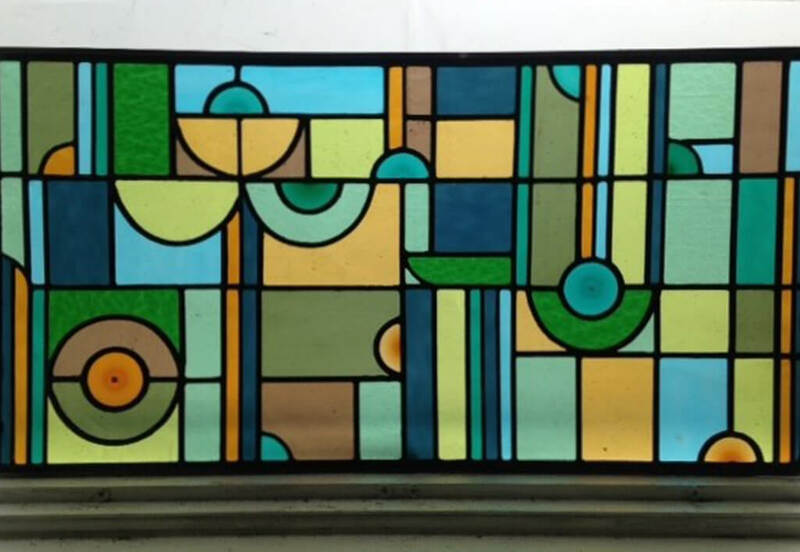 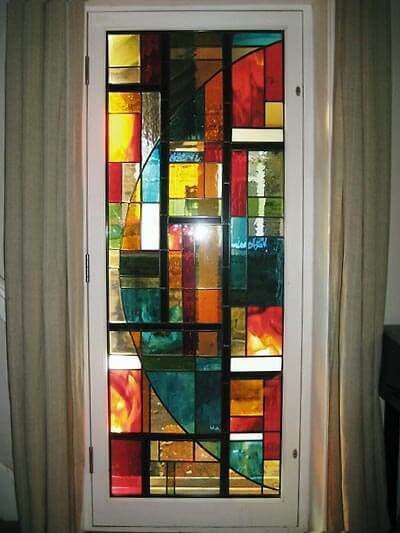 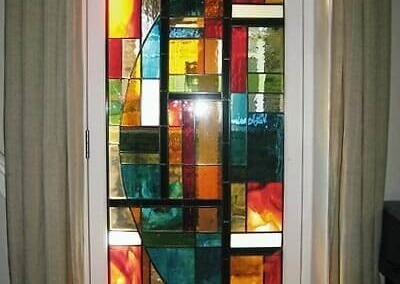 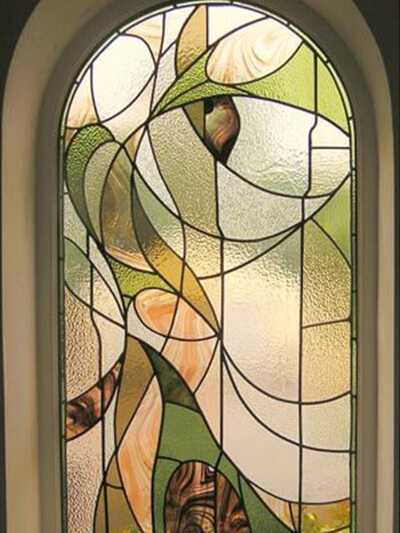 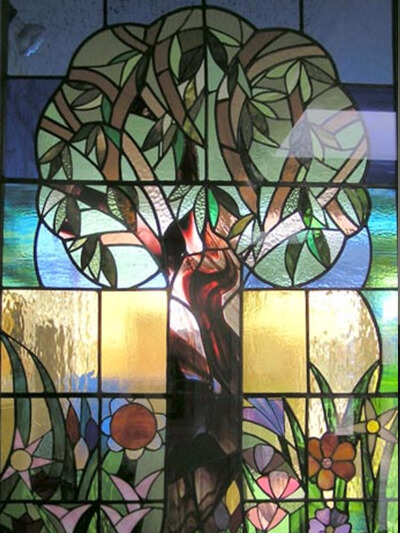 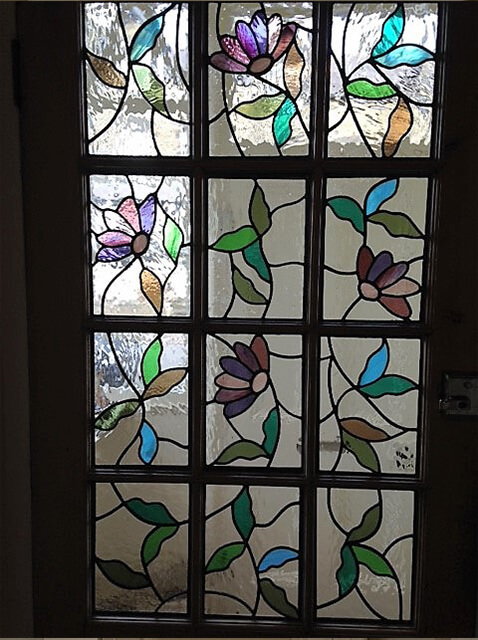 Stained glass can be produced as windows or as individual art pieces. 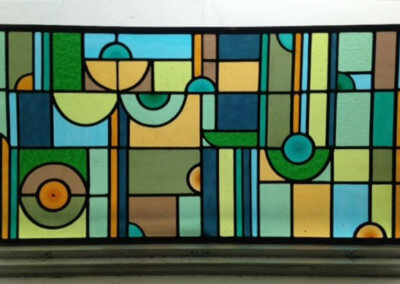 These are best viewed against natural light or with background illumination. 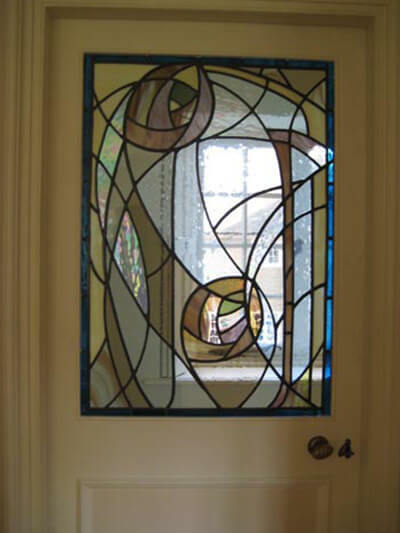 They can be fixed, or can hang or can stand free on their own as items to be admired and enjoyed. 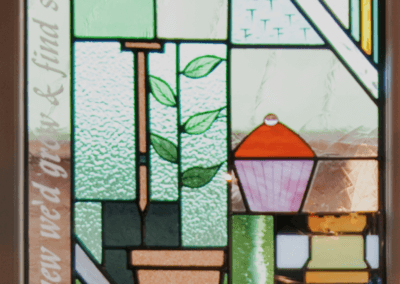 Each piece is individually commissioned and those highlighted in this portfolio provide examples of what can be produced. 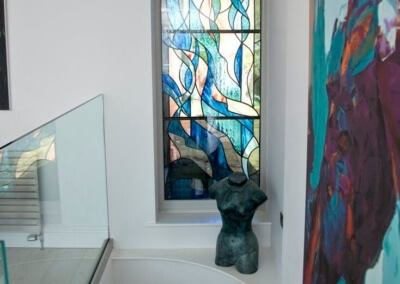 This range of bespoke individual pieces illustrates the breadth of designs that have been commissioned in residential settings where a contemporary “feel” has been required. 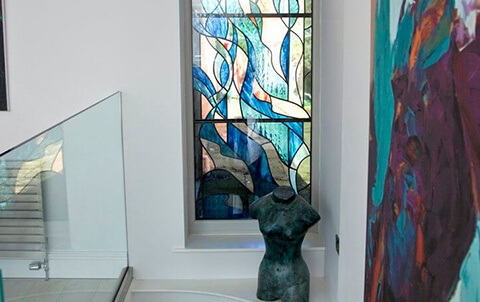 The creative use of colour, texture and techniques can produce a dramatic effect enhancing the interior space. 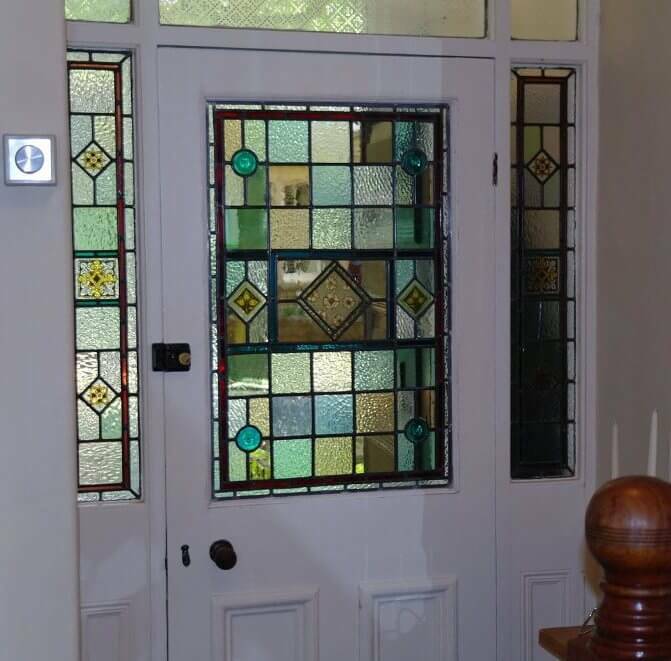 Sometimes a property demands sympathetic retention of traditional features to properly reflect an era or particular style. 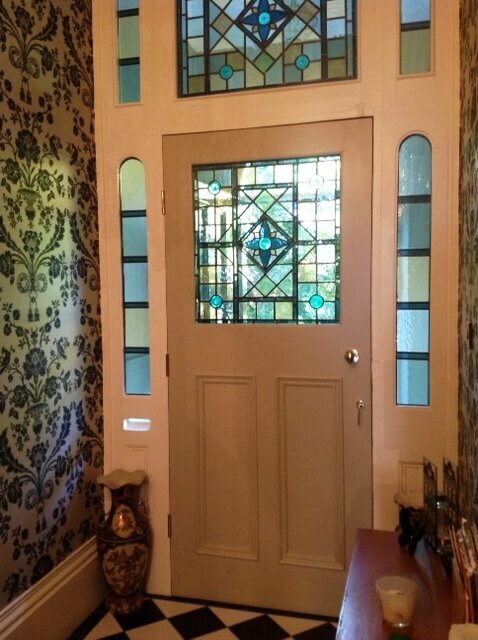 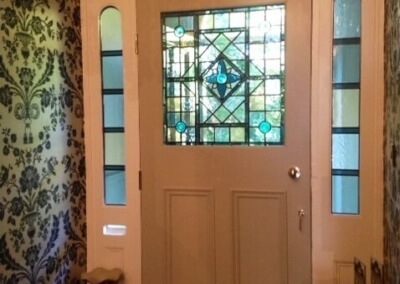 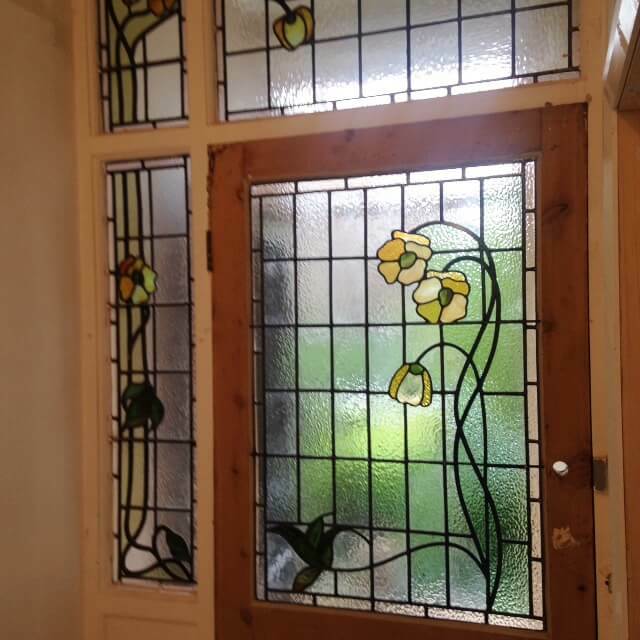 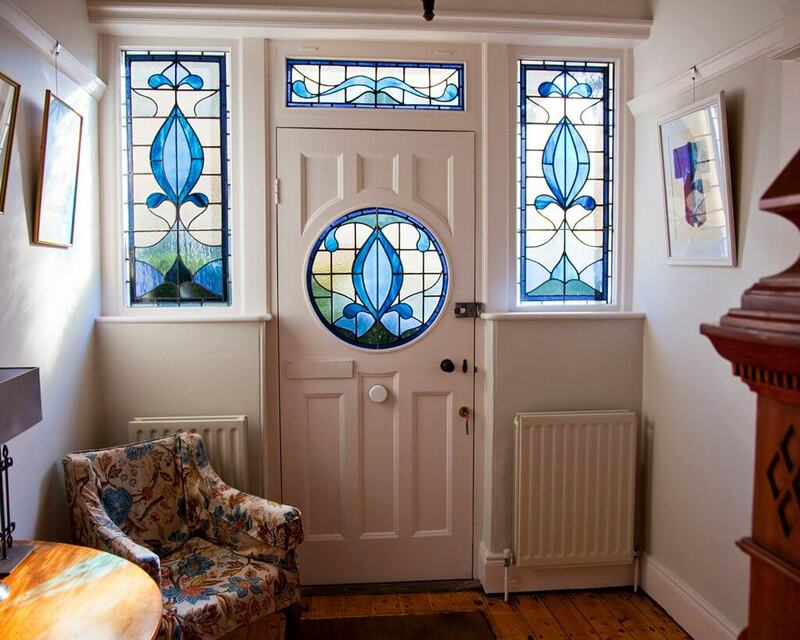 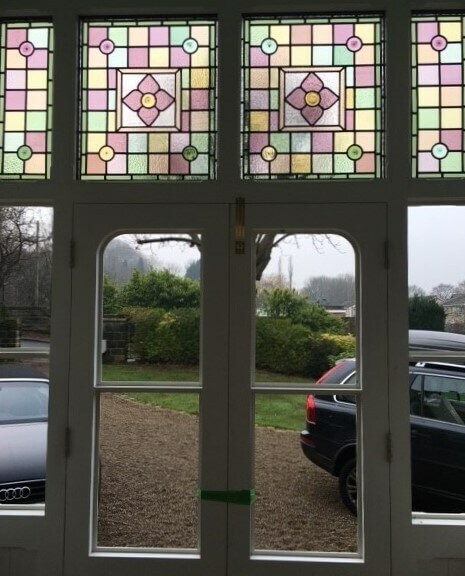 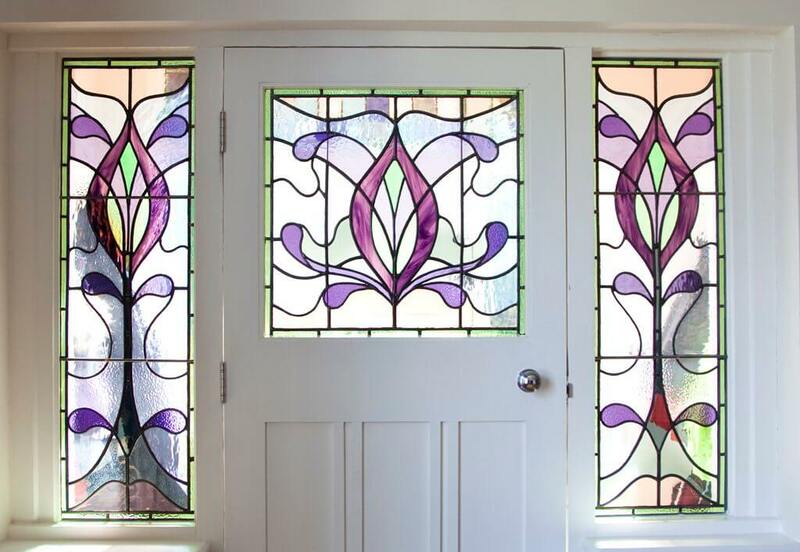 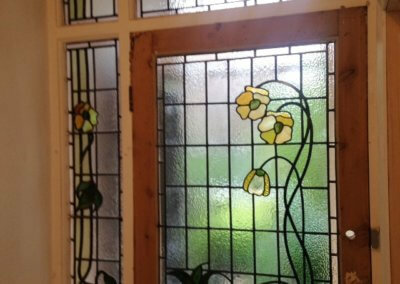 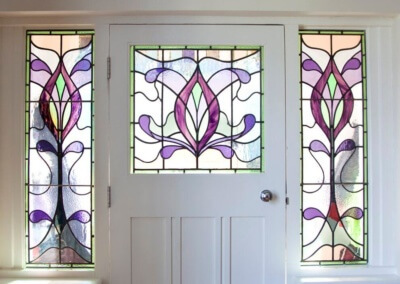 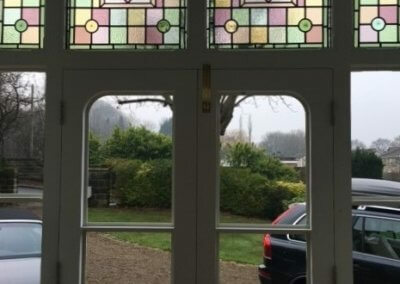 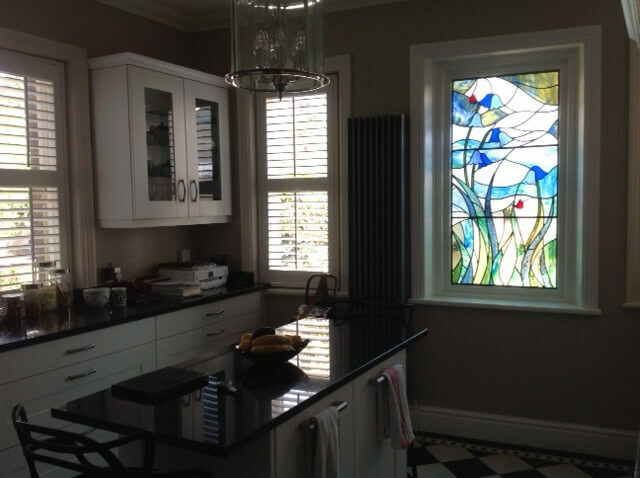 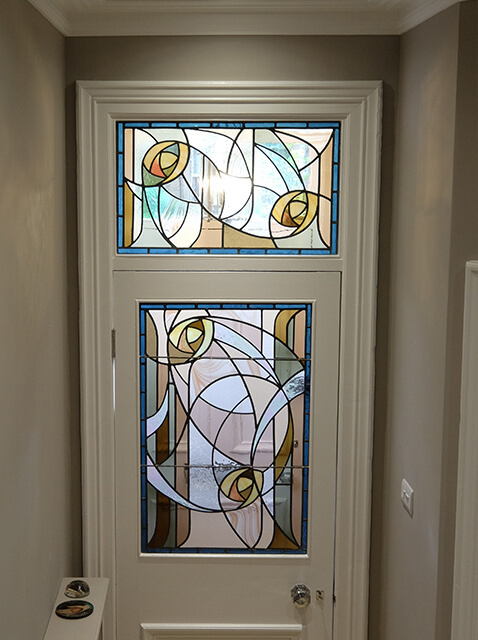 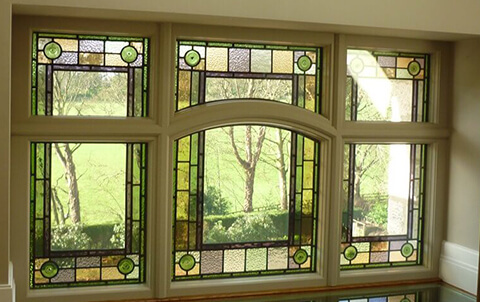 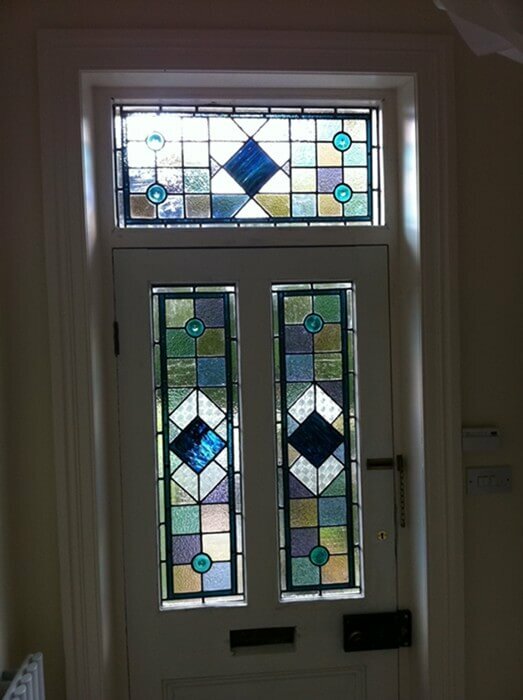 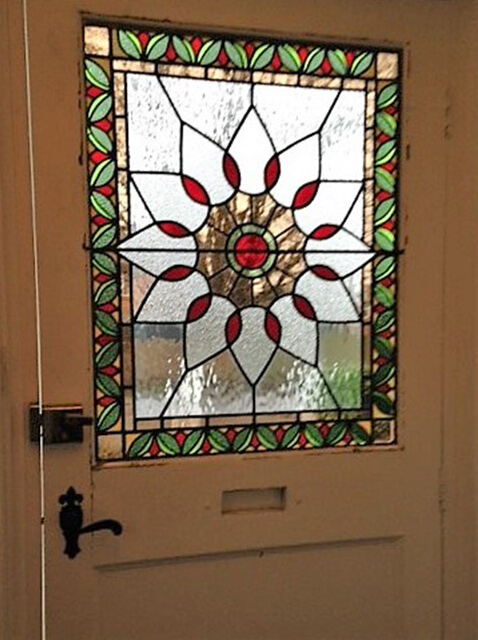 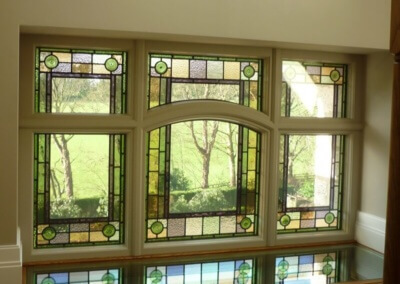 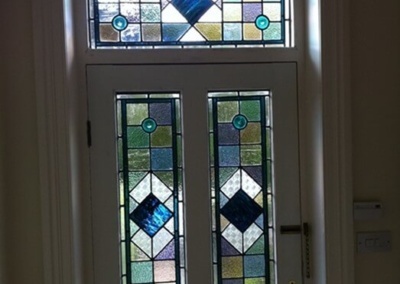 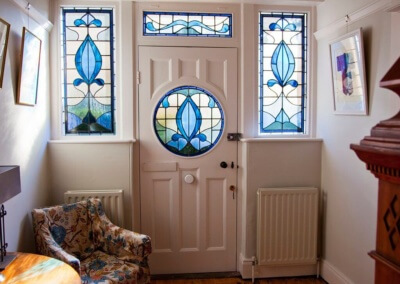 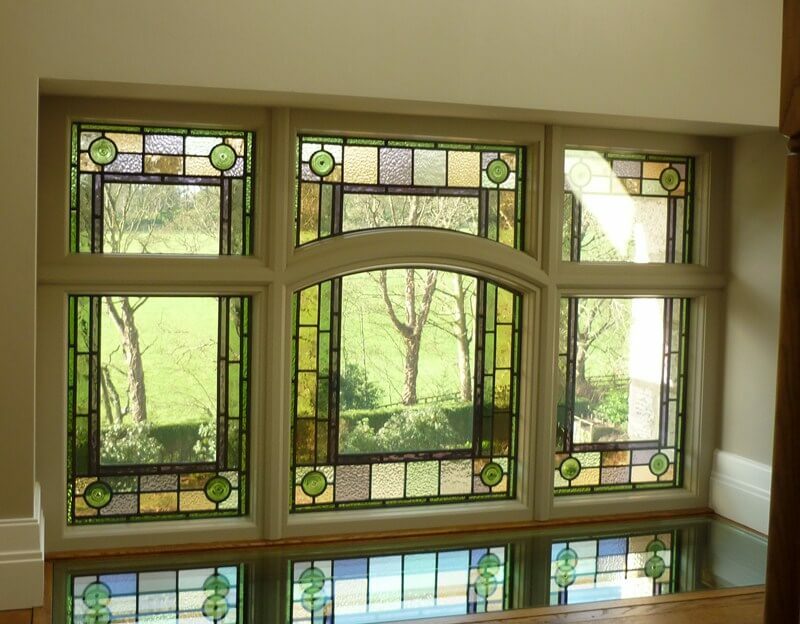 Windows that pay homage to the Victorian or Edwardian periods , or the Art Nouveau movement, have been commissioned, designed and produced to blend seamlessly with features already in the home. 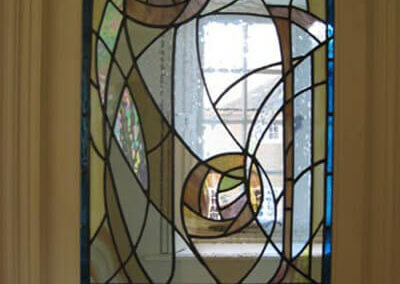 This section contains examples of such work. 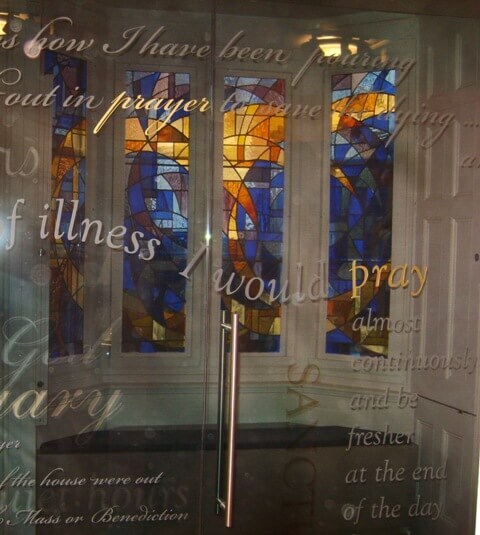 Public buildings often have a proud tradition of reflecting civic achievement. 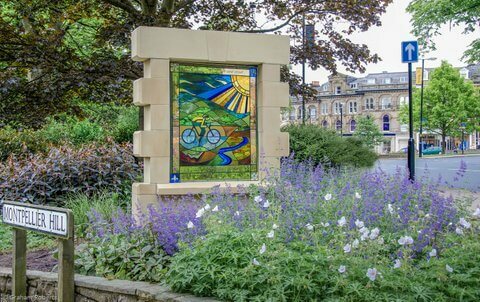 I have often been asked to produce pieces of work which reflects this civic pride by telling stories or illustrating past achievements. This portfolio reflects that work. 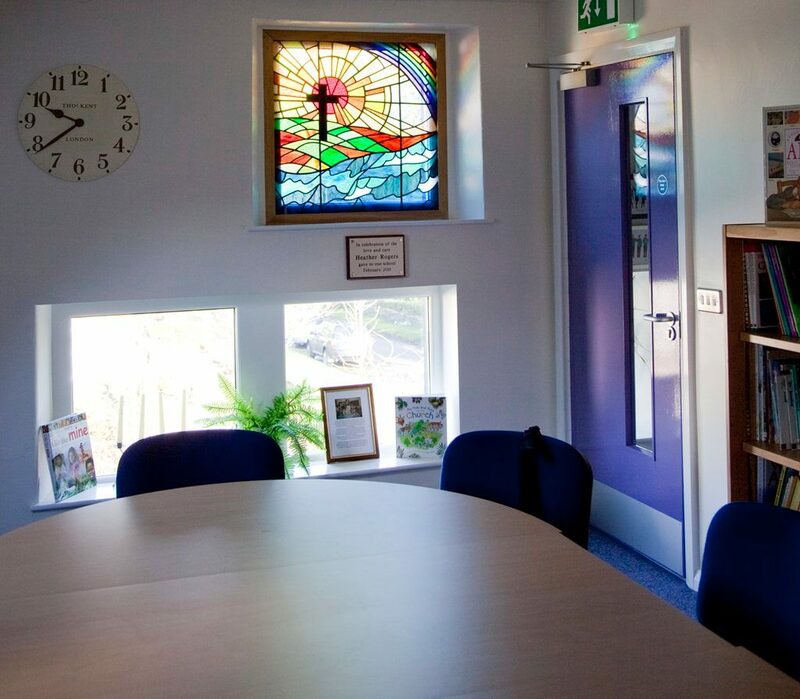 The quality of educational environments can have an effect on pupils who study, and staff who teach, within them. 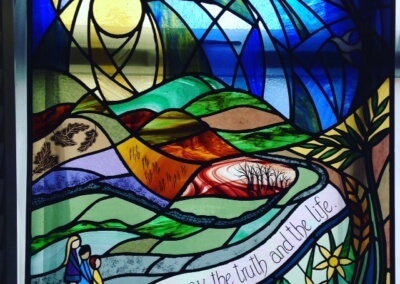 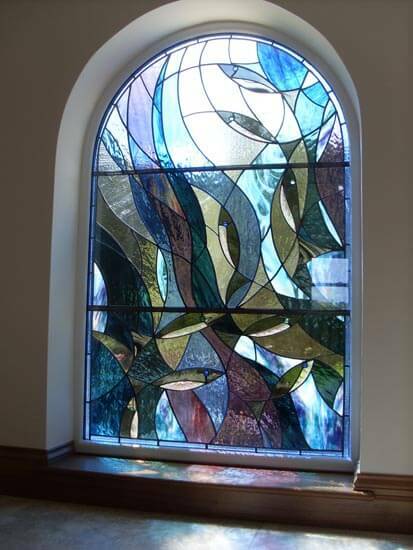 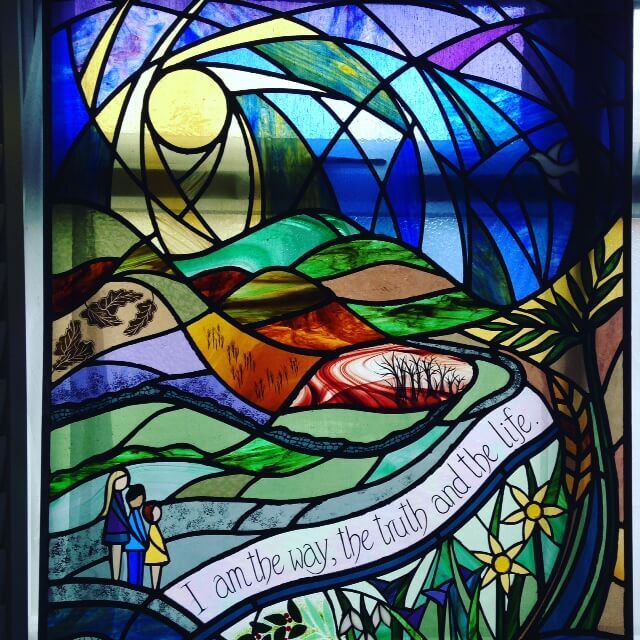 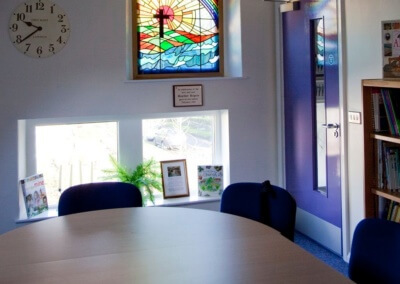 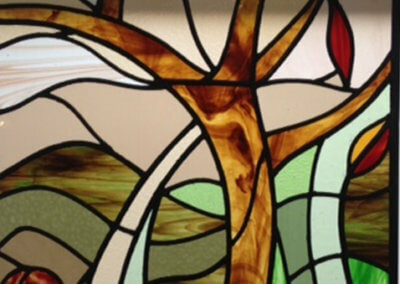 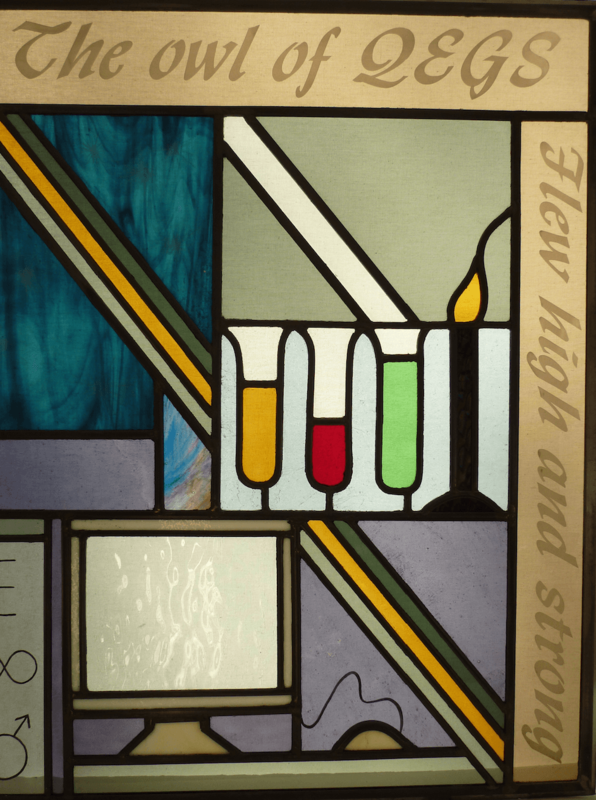 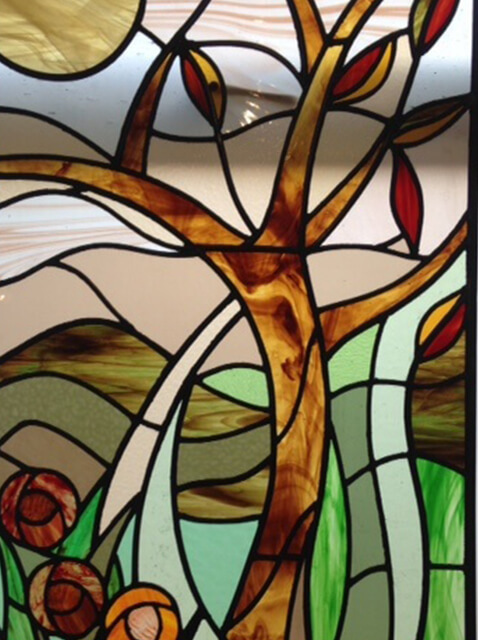 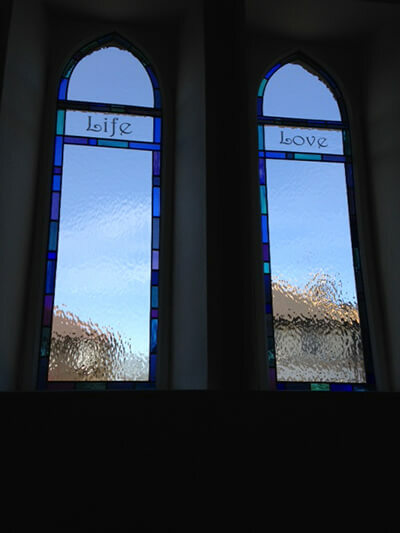 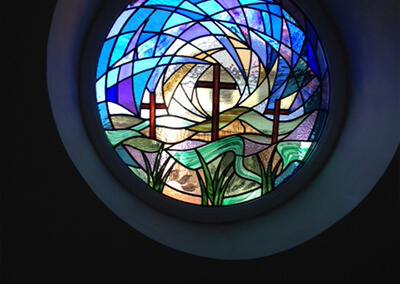 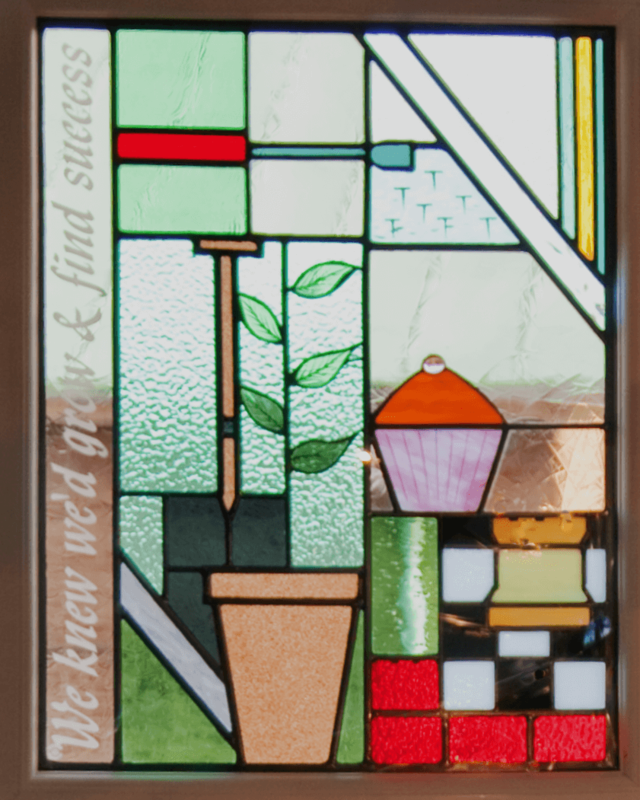 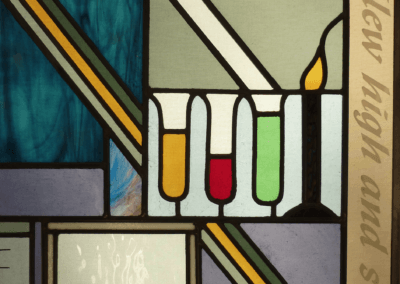 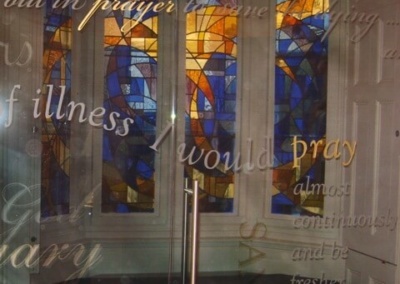 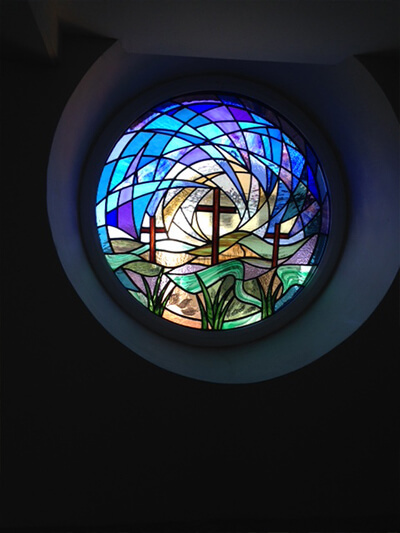 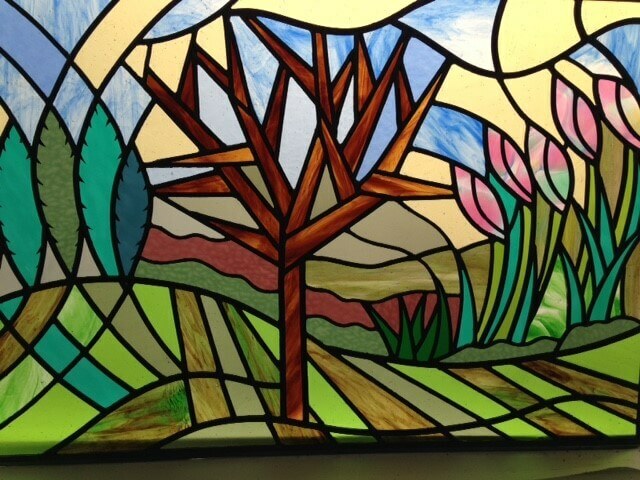 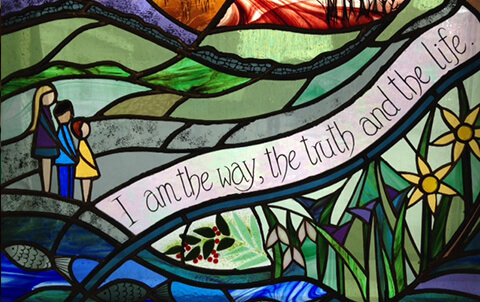 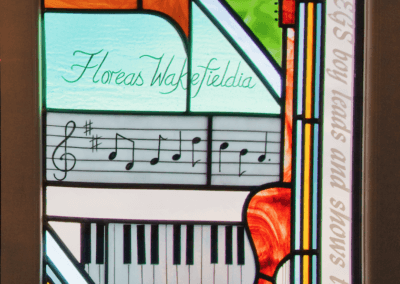 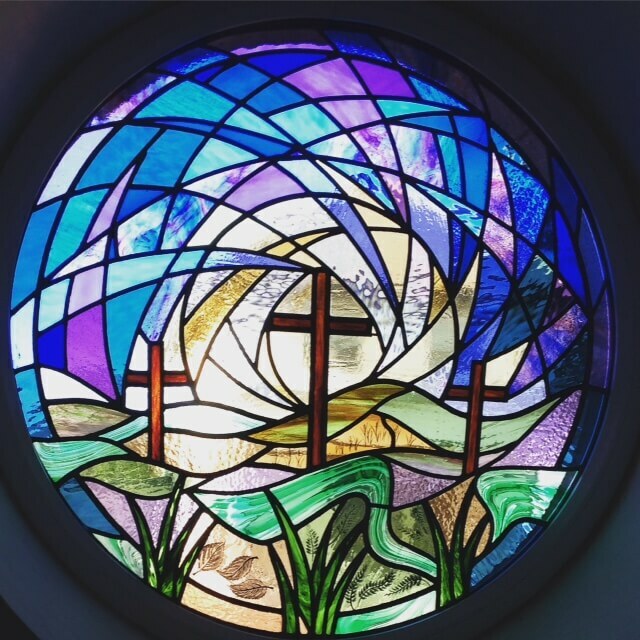 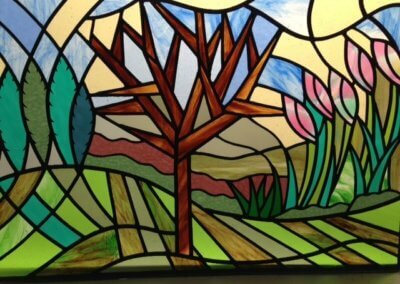 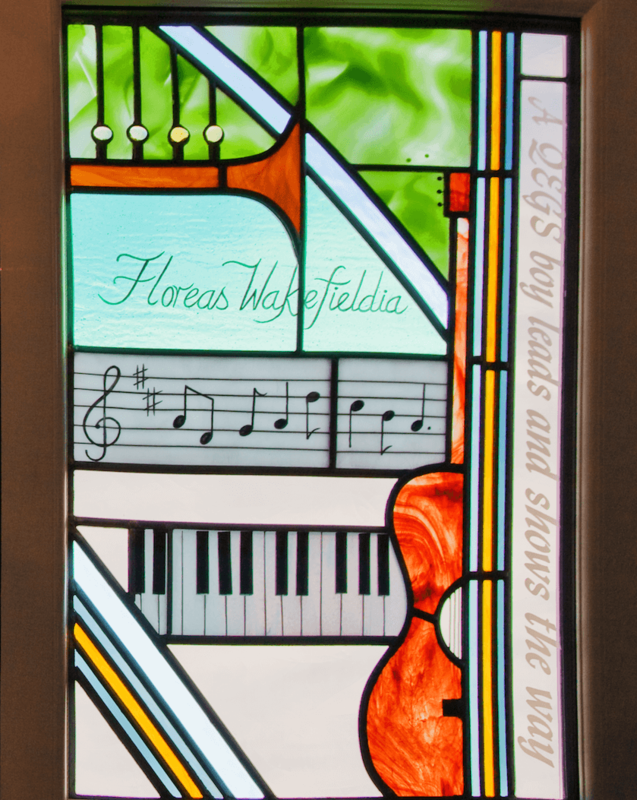 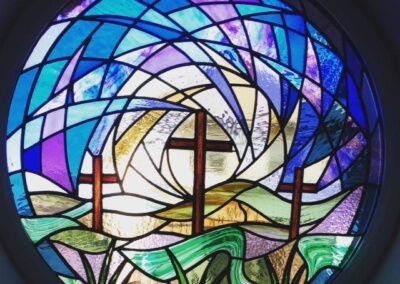 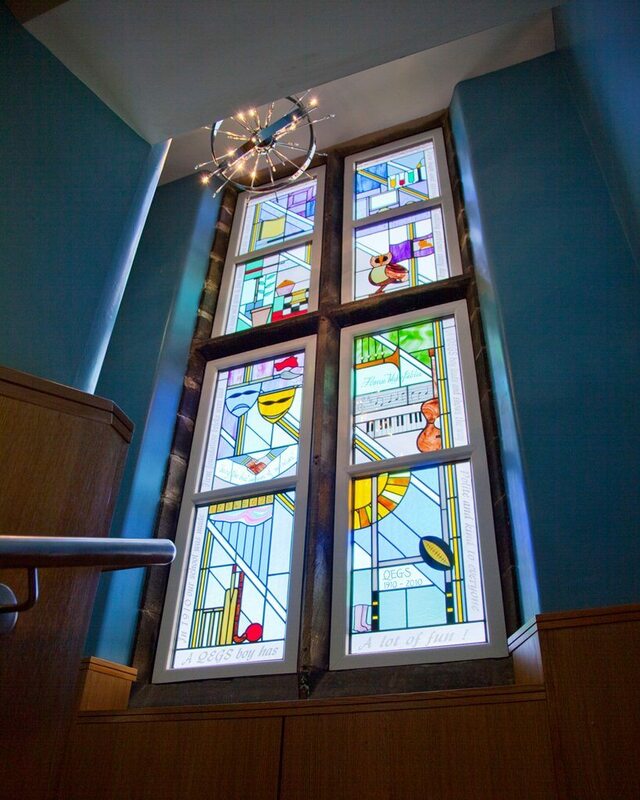 The addition of beautiful stained glass in learning environments can help to stimulate, challenge, celebrate or commemorate. 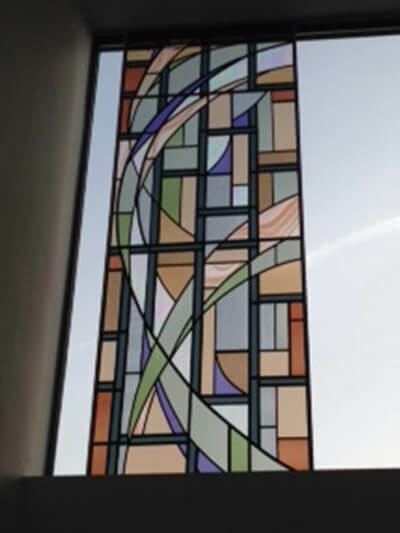 I often work alongside students to develop designs that reflect their own interests, as this can produce a real sense of ownership within the school or college. 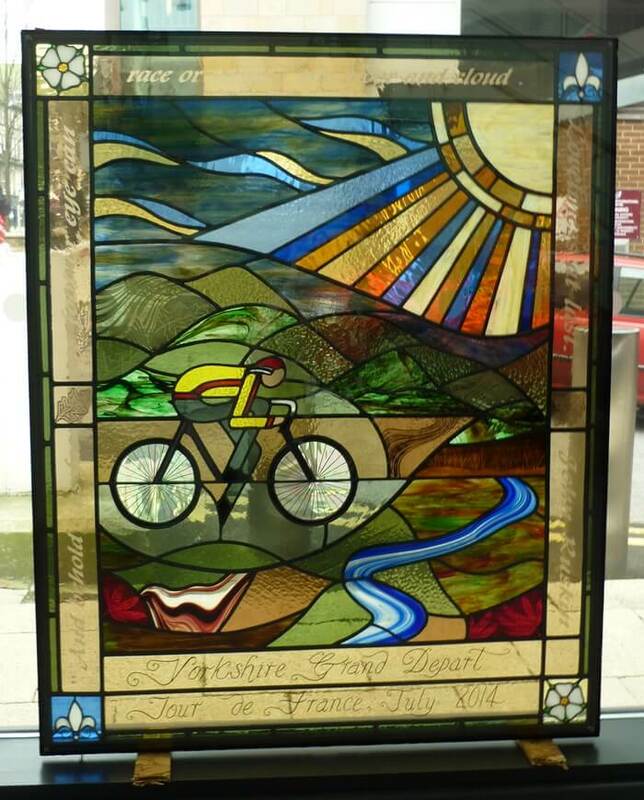 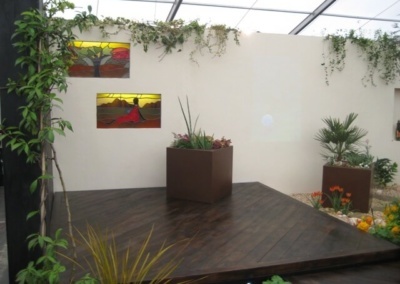 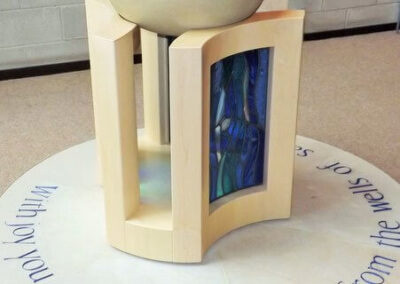 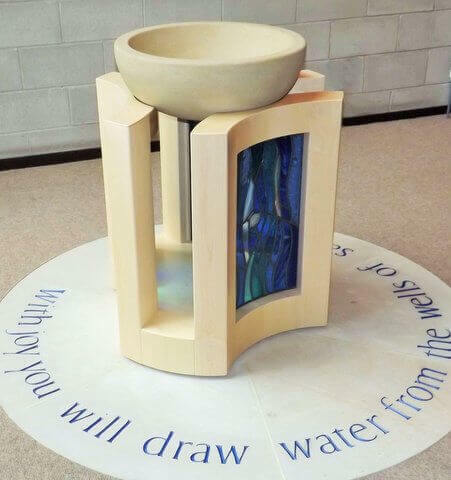 Here are some examples of key pieces commissioned for display in educational establishments. 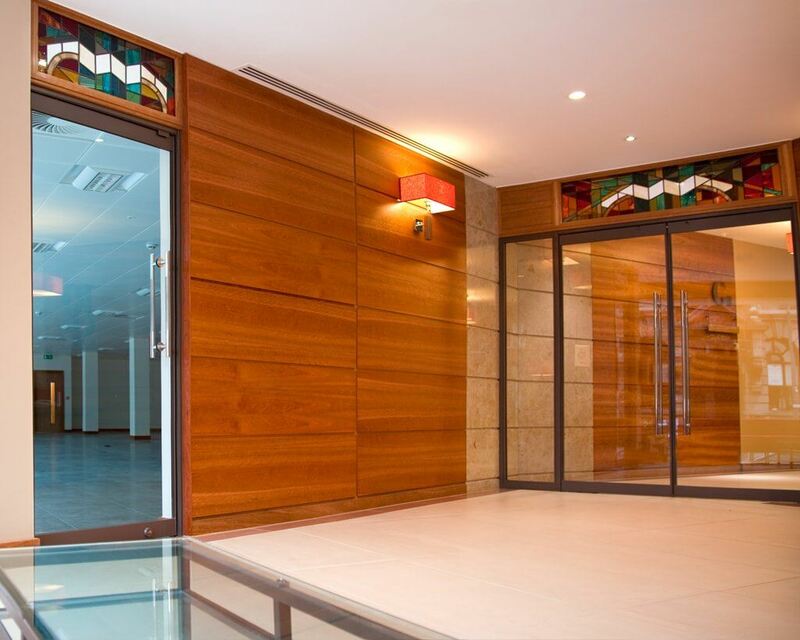 Commercial buildings are places where people spend a lot of their working time. 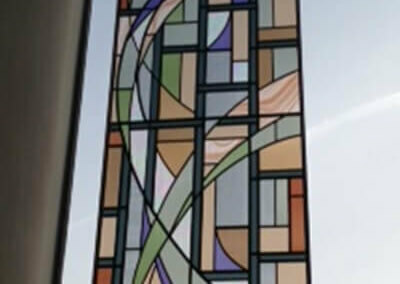 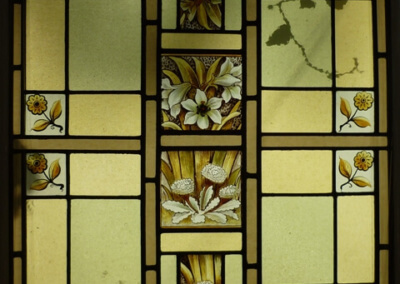 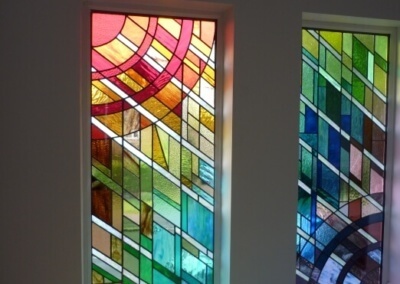 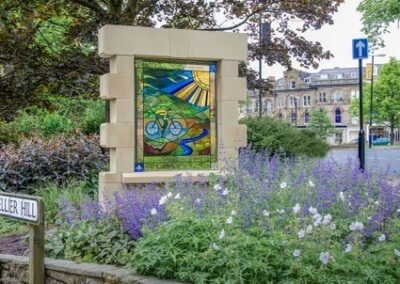 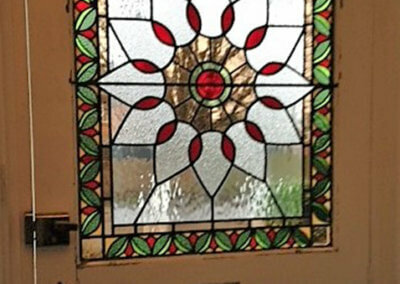 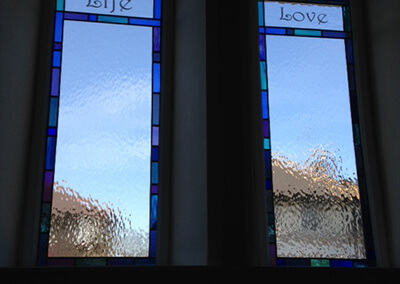 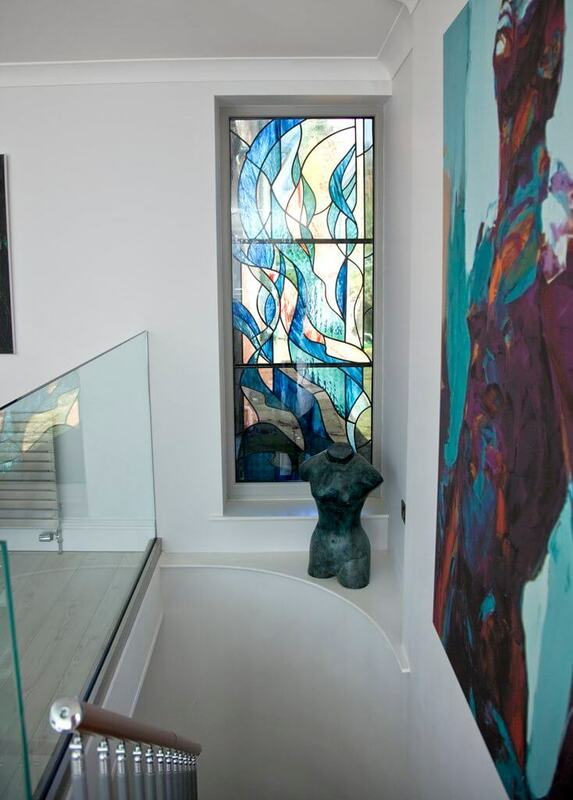 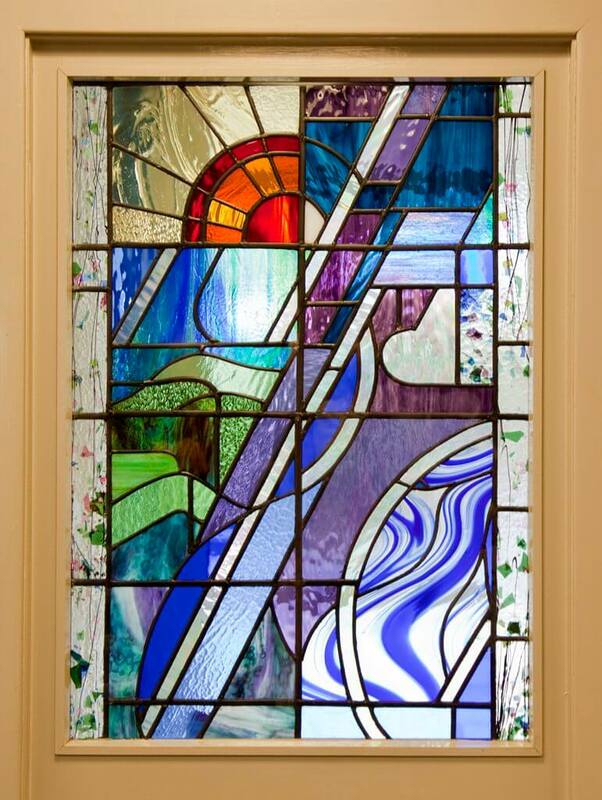 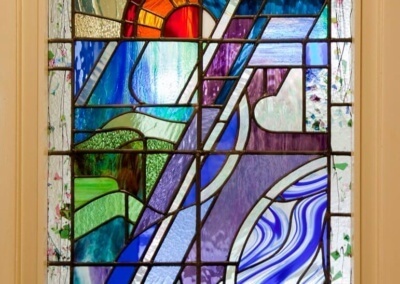 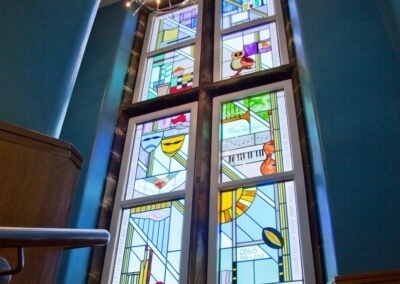 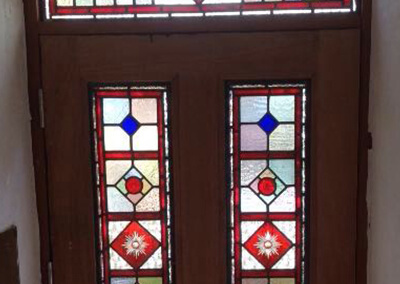 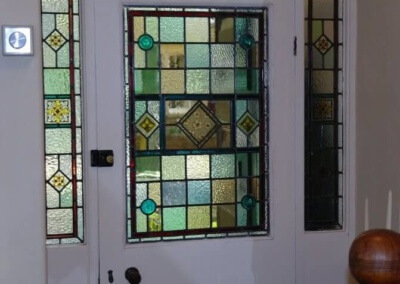 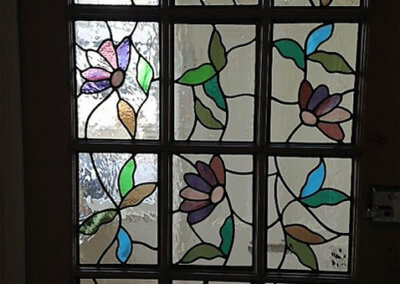 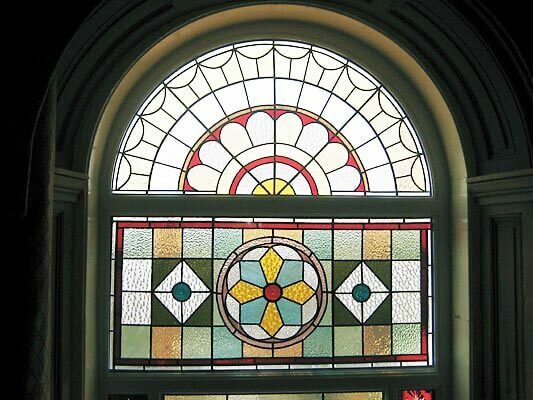 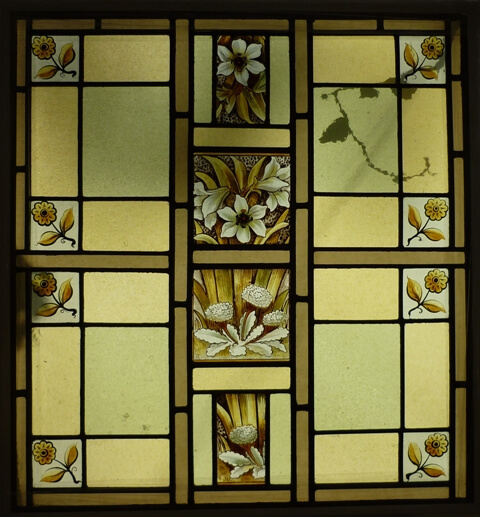 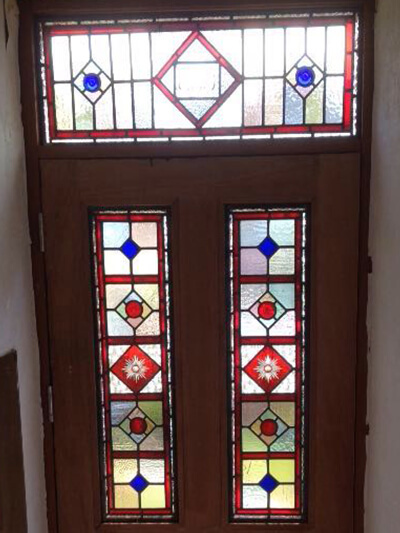 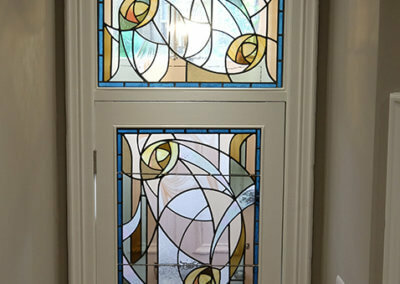 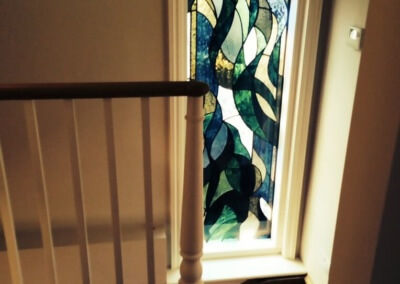 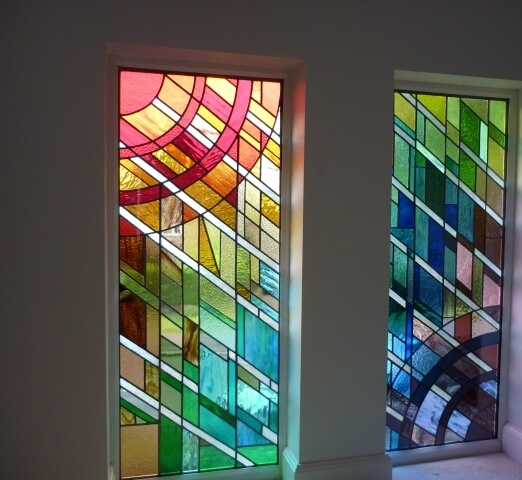 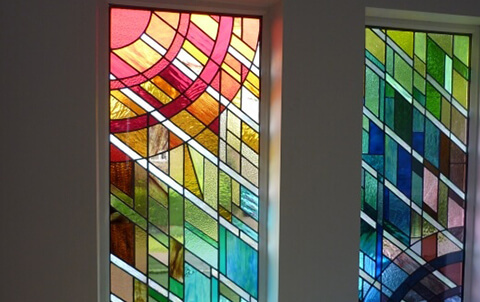 Enlightened property owners and landlords can enhance that space bey commissioning stained glass pieces that transform offices form the mundane to the challenging and interesting. 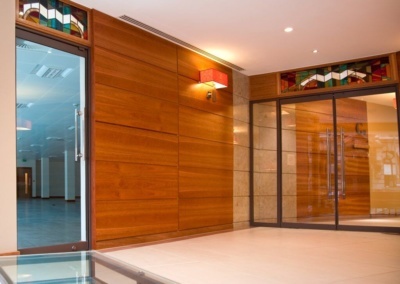 The visual impact of such office commissions is highlighted here.